An underground classic in every sense of the term, Slum Village's 1998 production Fantastic, Vol. 2 was a breath of fresh air for hip-hop heads when it finally hit shelves in 2000, earning heavy acclaim and artistic clout for the trio of T3, Baatin, and the late production legend J Dilla. Fantastic, Vol. 2 featured vibes and lyrics harkening back to the classic sounds of De La Soul and A Tribe Called Quest, smooth and infectious production that would go on to set a blueprint for the 00's arrival of neo soul, and top-shelf guest appearances from Q-Tip, D'Angelo, Busta Rhymes, and many more. Now, upon the 20th anniversary of the album’s completion, Ne'Astra Media Group is proud to bring a whole new collection of long lost tracks from the Fantastic, Vol. 2 sessions to you. 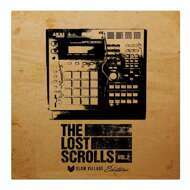 Produced between 1996 and 1999, The Lost Scrolls Vol. 2 (Slum Village Edition) features 11 unreleased demos and remixes featuring the classic Slum Village lineup. Tracks that have never previously been heard, and might not have ever seen the light of day otherwise. Featuring a never-before-heard freestyle from J Dilla, a newly discovered remix of the single “Hold Tight” featuring Q-Tip, a long-lost Kurupt-guesting track “Talk About Hoes”, a posthumously discovered Baatin solo cut, and numerous other unearthed gems of underground hip-hop.